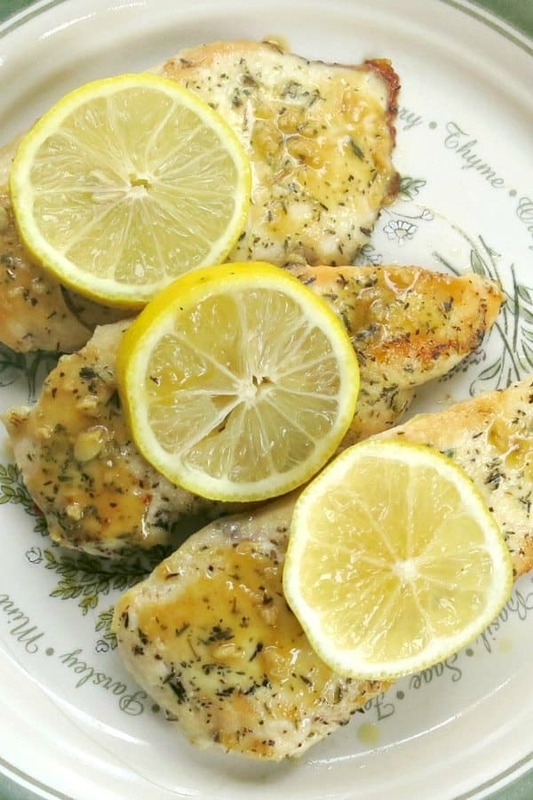 Pan-fried Lemon Chicken Cutlets are drizzled with a lemon sauce that’s infused with garlic. This tasty, low-carb dinner uses just one pan and is ready in under 30 minutes! When you don’t even have time to preheat the oven, make pan-fried lemon chicken cutlets. Use juices in the skillet to make lemon garlic butter sauce and drizzle that on everything in site! BAM! Dinner is done. And, it’s delicious! 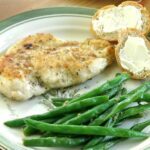 If you DO have time to turn on the oven, then you’ll have to choose between this recipe and Baked Lemon Pepper Chicken. And, when you need a break from poultry, check out Lemony Baked Basa or Rock Shrimp. Lemon is the star of these quick and easy seafood recipes too! Lemon lovers…we’ve got you covered! What is a Chicken Cutlet? A chicken cutlet is a thinly sliced piece of a chicken breast. They are labeled with this name and can be purchased in the grocery store. Or, make your own by cutting a chicken breast in half and pounding it to the desired thickness. The thinner the cutlet, the faster it will cook! Using a chicken cutlet is one of our favorite tricks for getting dinner on the table fast. Flour – we use unbleached flour. Use almond flour or coconut flour for the gluten-free version. The herbs are easily varied, choose ones that go well together and with lemon. Check out Season This With That by The Kitchn for ideas. Note: The herbs also season the lemon sauce! Evenly dust each chicken cutlet with the breading. It will be lightly coated, on purpose. The breading is not heavy and egg is not needed to make it stick. Heat olive oil and melt butter in a large skillet or pan. Remove chicken from the pan add remaining butter, chicken broth, and garlic to the pan. Bring the sauce to a boil and then simmer for about 5 minutes or until the mixture thickens. Some of the breading will remain in the pan. That’s ok! It thickens the sauce. 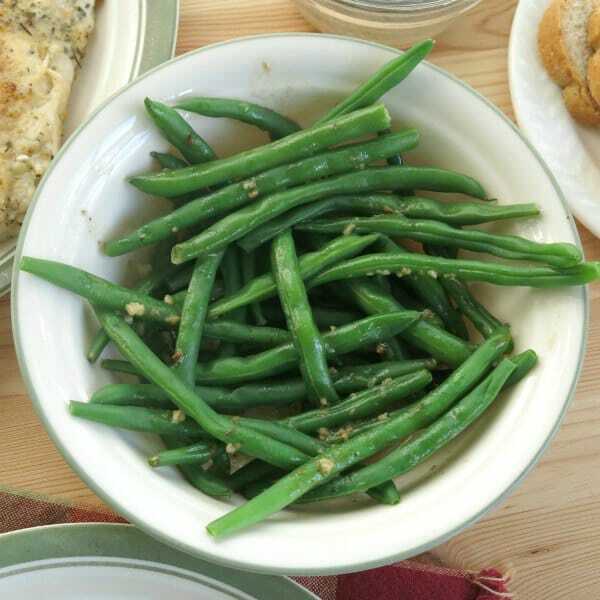 Drizzle the lemon butter garlic sauce over the chicken cutlets and everything else including the green beans. 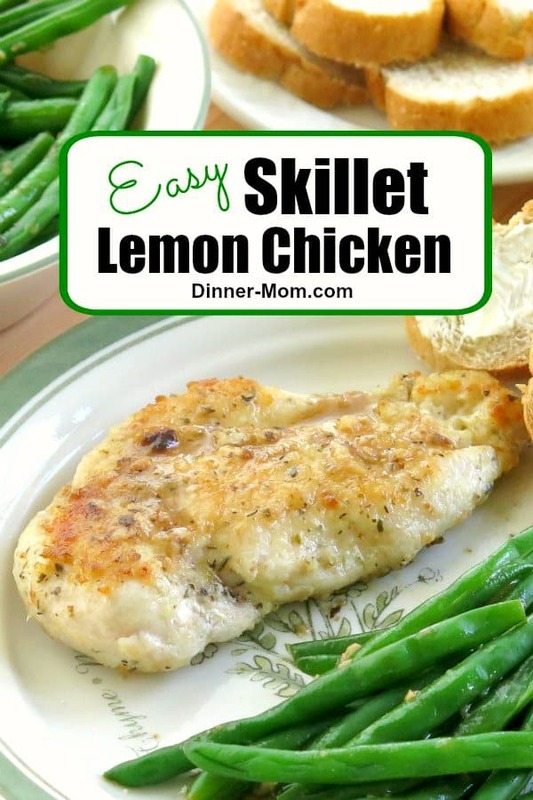 Pan-fried lemon chicken cutlets are drizzled with a lemon sauce infused with garlic. You'll be amazed that something this tasty can be ready in under 30 minutes! 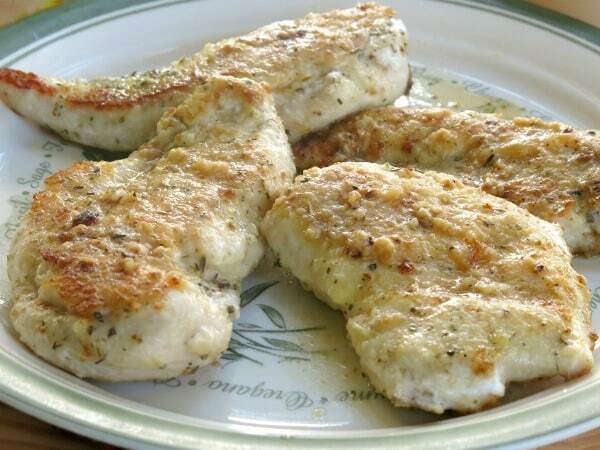 Arrange chicken cutlets in a single layer on a plate. Combine flour, basil and thyme in a small bowl. Sprinkle half of the flour mixture over the chicken and then turn over and sprinkle the rest over the other sides. Swirl olive oil in a large pan. Add 1 Tablespoon of butter to the pan and melt over medium-high heat. Add chicken to pan and cook about 5-6 minutes on each side or until the outside is browned and the inside is no longer pink. Remove chicken to a serving platter and keep warm. Melt remaining butter in the pan. Add chicken broth, lemon juice and garlic to the pan and stir to combine, scraping up brown bits. Bring mixture to a boil and continue to boil until sauce has thickened slightly or about 3-4 minutes. Spoon lemon garlic mixture over chicken and garnish with lemon slices. You had me at lemon 🙂 Looks like great week night meal! Thanks Deb! I love the lemony taste too-so fresh! I adore chicken cutlets for a quick weeknight meal. And they cook up so tender and moist. Much easier than a large whole chicken breast. I’m lucky that our Whole Foods has them beautifully cut for when I don’t feel like wrestling a whole chicken breast into thinner pieces. Your recipe sounds delicious Marjory. Thanks for sharing. Thanks Lean Ann! I’m a big fan of cutlets during the week too. Sadly, no Whole Foods near by…but, I’ve got my fingers crossed that it will change some day. Just buy skinless chicken breasts and cut in half to butterfly. Easy as can be. For even moister cutlets, please in a gallon baggie and pound a few times. Thanks for stopping by! Great tips! I ran across your recipe and made it for dinner tonight. Tasty and delicious! My husband commented that the recipe was a keeper. I like that! Makes menu planning in the future so much easier! I look forward to trying more of your creations. Thanks for posting. Thanks so much for your feedback and stopping by. It’s good to have a few quick an easy recipes that everyone likes in your arsenal! The receipe looks amazing. I am on a low fat diet, do you know the fat and calorie content? Thank you for stopping by. Unfortunately, I don’t have the nutritional information. You may be able to calculate using an app like My Fitness Pal. I make this recipe all the time, only I flour, egg and then bread cutlets in Italian breadcrumbs before frying. After all chicken is browned, put on paper towel to drain. Remove some of the oil from pan and then brown minced garlic, add chicken broth, 1/2 c white wine, juice of 1/2 lemon and fresh parsley. Put cutlets in a baking pan, pour sauce over top, cover with foil and bake at 375 for 25 min. This is Delicious! This looks so yummy and I love the lemon sauce. This is so perfect for weeknights! I love the sauce! Hi! I’ve never made this one up in advance. But, if you go this route, be sure to cover the chicken in sauce and cover the baking dish with a lid or aluminum foil to hold in the moisture. If heating up in the microwave, also cover with sauce and a lid or plastic wrap. Enjoy!